Newquay is going through what most of Devon and Cornwall seems to be experiencing; redevelopment to replace run-down old hotels with apartments and boutique places to stay. It’s got some way to go. I couldn’t do the maths to calculate how I’d best be able to cross the Gannel, a tidal river just to the west of Newquay. At Pentire on Crantock Beach the foot crossing was still under water when I arrived, and I took the extremely short ferry over the main channel – 60 pence for maybe 20 yards. This still left another wadeable stream for which I had to take my boots off. 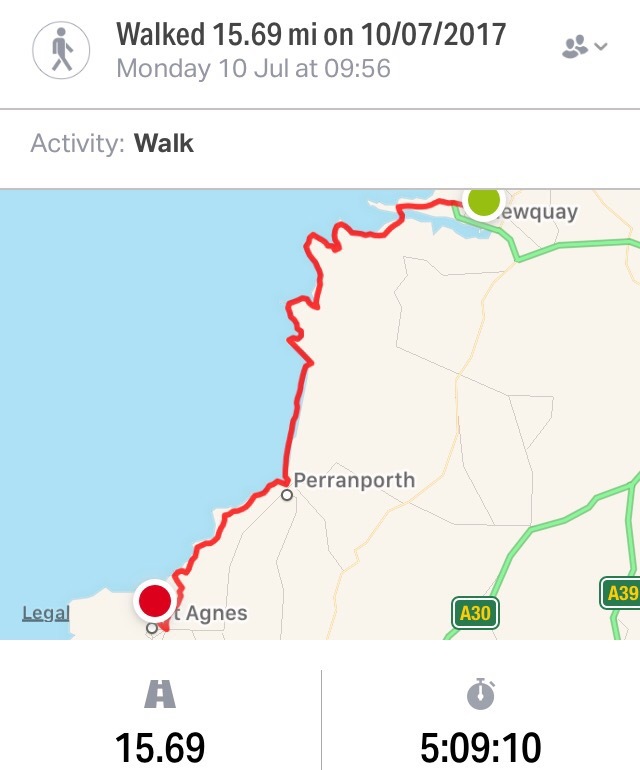 My toes are still hurting and I’m unsure how to sort them out (other than stopping walking …), but I’m pretty sure a spoon of wet sand in each sock at the start of the day isn’t what’s needed! The path was level and easy, largely along the cliff tops but interrupted by the tiring, dry sand of the occasional dune. Beyond Holywell Beach and the bleak, even sinister, MoD base at Penhale Camp, I was able to drop down onto the expansive beach at Perran Bay and walk along the two miles of sand into Perranporth. From there to St Agnes I was walking through former mine workings on the high cliffs, and the area is an industrial heritage site. The pretty village is spread out and incorporates several old mines and engine houses that mined copper, tin and arsenic. A lovely meal this evening at Schooners in the harbour of St Agnes with Lisa and John and Jill and Andrew. Out at sea we saw wild-swimmers, seals and dolphins or porpoises. I don’t think you’re allowed to photograph MOD bases, surprised you weren’t arrested on the spot! Despite the sore tootsies, you look extremely happy and well in your selfies! Guess you have your waterproofs out again today as rain predicted over the South West. Keep hobbling, almost there. GCHQ and now MOD bases. You will most certainly be on a watchlist of some description. Quite probably one which implores people to not approach you as you are carrying potentially lethal pathogens but more importantly give off the odour of an overripe piece of Stilton and could wipe out half of Wiltshire, the home of portion down, with one whiff of your feet. An old goat has nothing on you. Keep on trudging. Nearly there. Your blog is getting more and more eloquent with every stride….is this the beginning of the book we all have in us ? Off to Majorca tomorrow but will try to follow the denouement–or finale perhaps a better word–from a distance. You may need to ditch both the boots and a couple of toes to get this over the line ? C’mon Salisbury ! Fat bloke-you know who you are!